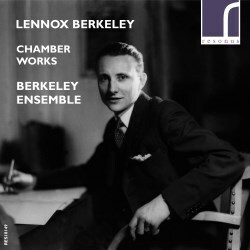 This disc represents a mixed gathering of pieces spanning all of Lennox Berkeley’s creative life. It begins with a brief Trio composed when he was in his mid-twenties and an even earlier Sonatine and includes two works from the 1970s. I will discuss the pieces in chronological order beginning with the Sonatine for clarinet and piano. Berkeley was a bit vague about opus numbers but this could be regarded as a pre-Op. 1. Although by this time (1928) Berkeley had become part of the circle of Stravinsky and Nadia Boulanger and had become very friendly with Ravel this Sonatine is very much of its own. Hindemith is alluded to and certainly the bitonality of Poulenc but his own language is formed. No wonder Frederick Thurston took to it and performed it several times. The middle movement is especially moving. It is the last work on the disc and makes a suitably arresting end. From the following year comes the first piece on the CD going by its French title Pièce scored for flute, clarinet and bassoon. A clue to its ‘Milhaudian’ language may be that Berkeley enjoyed frequenting a fashionable bar called “Le Boeuf sur le Toit’. Also it appears that this little, skittish work was completed in Madame Boulanger’s home possibly as an exercise in what was then modernist counterpoint. At the time of Donald Brook’s book ‘Composer Portraits’ of 1946, Lennox Berkeley was already 43. Brooks opens his remarks by saying that the composer “is something of an enigma, and one cannot help wondering what place he will take in modern English music”. At the end of the article he does mention the String Trio as being of interest. It is a compact three-movement work with a quite contrapuntal closing allegro which briefly brings back some material from the beautiful middle slow movement. The opening Moderato is lyrical and quite English by Berkeley’s standards. Any composer will tell you that writing a String Trio is more challenging than a quartet but Berkeley’s suave ways typically carry the day. It seems probable that the Three Pieces for solo viola were composed in the mid-1950s as that is when the dedicatee Stephan Deák was working as an orchestral musician in London. Did he ever play the pieces - no one can say? They turned up in a junk shop in the Camden Road in 2008 and were played in 2009 for the first time. There is quite a history to Deák which I won't go into here. The pieces are very short but perfectly formed with the central Lento being the longest and most profound. The three-movement Sextet for clarinet, horn and string quartet has allegros as its outer wings as it were. It's what a friend of mine rather harshly calls “the classical music of the chattering classes”. I think I know what that means: the tempo being bubbly, rhythmic and the texture contrapuntal and busy. The lyrical and essentially singable middle Lento is memorable and makes a good reason by itself for playing the piece. In fact all of it is highly idiomatic and pleasing to the performers as well as to listeners. The Introduction and Allegro has become a part of the double bass repertoire, Indeed I recall hearing it whilst examining somewhere in the UK. It demonstrates how Berkeley’s language retained its character right up to the 1970s. It is lyrical but also spiky, emotional, yet also detached but always brilliantly idiomatic. As Rodney Slatford, the original performer and dedicatee, says “the piece needed no alteration” although it was the composer’s first and only piece for the instrument. Also from 1971 is In Memoriam Igor Stravinsky: Canon for String Quartet - an aphoristic chip off the old block you might say. I still have in my possession a prized copy of Tempo magazine for later in that year in which sixteen composers wrote tiny pieces in honour of the great man. It uses the same scoring as Stravinsky’s Double Canon of 1959 written in memory of Raoul Dufy, a painter friend. It is a reflective and calm little piece and difficult to programme in normal circumstances, one would imagine. I haven’t singled out individual performers or performances because they are each, it seems to me, ideal and wonderfully illuminating. In addition, three are world premiere recordings. The Berkeley Ensemble can be trusted to show a total belief and understanding in the composer and his language. If you like British chamber music then do not hesitate to search this disc out.